If you're a climber, own a pair of climbing shoes and want to climb outside near Montreal, this is for you! Climb outside with a certified instructor! You don't need to be an expert climber to book this activity, there are routes for everyone; from 5.5 (3) to 5.13 (8a). Even if you've only climbed in a gym, you'll have fun climbing outside for the first time in a safe and professional environment. You do have to have your climbing shoes with you! Depending on your level of experience, we can either stick to top roping or we can also do sport climbing (lead) as most routes are bolted. 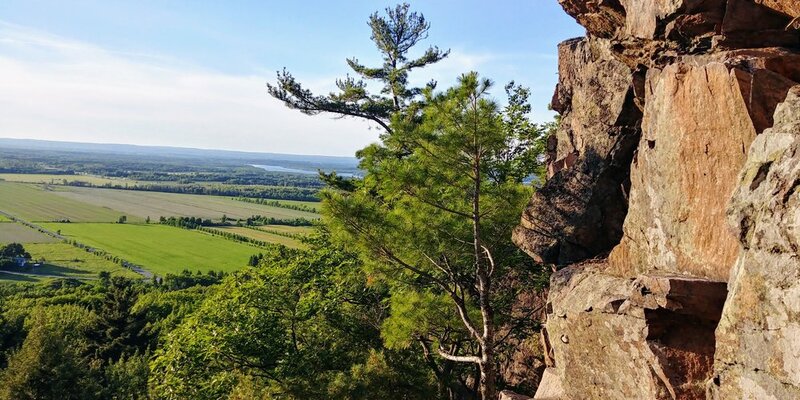 The crag is about 50 minutes away from downtown Montreal. We'll meet in Montreal close to a metro station and we'll drive to the crag in my brand new hybrid car ;). We'll park right at the mountain and then there is a short 10-min hike to get to the rock. There's about 80 routes to choose from. I'll suggest the best routes for you. I'll take care of the anchors and I'll belay you all day. You just climb and have fun! I'll drive you back to Montreal just in time for dinner time! We leave Montreal at 10 am and we'll be back between 5 pm and 6 pm. Bring your climbing shoes, water, snacks, your smile and your enthusiasm. I provide all the rest! Climbing days can take place almost every weekend of the spring, summer and fall. But they get booked fast! Contact me to reserve your spot! I'm passionate about the outdoors and especially crazy about rock climbing (I'm a certified instructor with the Quebec Mountain Federation). Contact me to reserve or to ask a question!